In April I published about a book about practice of presence and then… in the end of the month, after finishing the project (which meant quite a few hours of sitting at the computer, writing, thinking, rewriting…) and after a winter in which I closely followed world news, trying to figure out what is going on, I felt a bit exhausted. I was wondering, what really matters and even with all the knowledge and experience I have, I couldn’t find “the exercise” to do, to really notice myself, my surroundings and to sense the next step. It is funny to write this now, because at the same time I had a strong urge to go outside, do something physical where I can experience the immediate value or effect of my action, notice my body, wind, plants, growth… I decided to take a few weeks off the city life and went to an island in the North of Norway, to work on a vegetable farm. Which of course, was ‘the next step’. 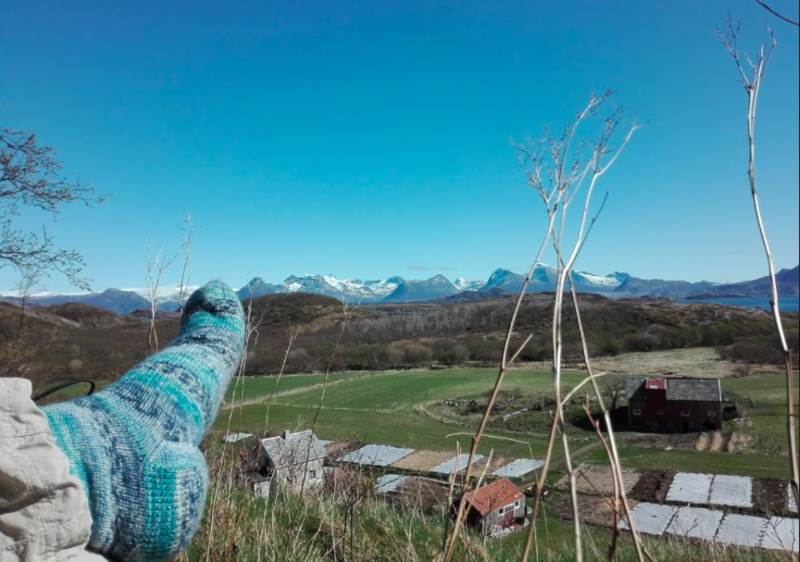 For three weeks in May I was outside almost all day, either planting vegetables, or hiking on the beautiful island, up the mountains or just sitting by the sea and inhaling the space and air from the ocean. The experience of being outdoors in rough wind, as well as my countless discussions with the farmer up there, who had strong opinions (about almost anything) allowed me to feel my boundaries. To say stop, when I had enough of his complains or righteous opinions, as well as ask when I wanted to hear more from his experience. To walk in the wind and enjoy the tingling in the nose, or to find a spot behind a little mountain to be able to relax into the warmth of the sun… All the time looking to find ways, to move through my experiences, listening both to the surrounding as well as my own capacity to be present or need to take a break of the intensity around. Back in April, I had felt that my ability to be as present as I want was a bit exhausted. In this simplified surrounding in the North, I experienced strongly, my need for a movement between connection and isolation in order to be present – both with people or my own needs. Returning to weeks filled with visits from friends, new connections, summer, working intensly with my clients I also noticed, how this moment in rough nature was a movement of isolation, that allows me to be connected now that I’m back. I couldn’t put my finger on it before I left and returned, but a physical need allowed me to take that step. And I enjoyed really to see those different scopes of presence… in a regular day, taking moments of isolation or silence, in connection with people to notice when I need to be with them and when I need to be alone. And on the larger level – to notice this movement between strong, intense connections and need for space and air alone. Now I’m back home and I’m excited to be refreshed by this experience (as well as literally refreshed by the wind up there…) and continue the exploration of presence and connection in everyday life. I’m looking forward to a summer full of surprises, moments to rest and explorations. And as if she did it for me, my dear friend and colleague Daniela Razocher is offering bridges to presence for the summer just now. So this is one of the daily moments of training presence, I will explore. How about you? What does your summer offer you? What’s your practice? I remain curious and wish you an interesting summer.